Tassie Keltjin has come from a small farming town to attend college in Troy, “the Athens of the Midwest.” She’s swept into a thrilling world of books and films and riveting lectures, high-flying discussions about Bach, Balkanization, and bacterial warfare, and the witty repartee of her fellow students. At the end of the semester, Tassie takes a job as a part-time nanny for the newly adopted child of Sarah Brink, the owner of a trendy downtown restaurant, and her husband, Edward Thornwood, a scientist pursuing independent research. Tassie is enchanted by the little girl. Her feelings about Sarah and Edward are less easily defined, and as she becomes an integral part of their family, the mysteries of their lives and their relationship only deepen. She finds little to anchor her: a boyfriend turns out to be quite different from what he seems; vacations in her hometown are like visits to an alien country; and her loving, eccentric family no longer provides the certainties and continuity that shaped her childhood. Lorrie Moore’s ability to blend quick wit and hilarious observations of current trends with moving portraits of people struggling with loneliness, confusion, and the desire for love has made her one of the most admired writers of our time. 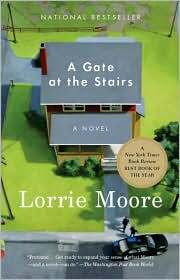 Capturing the mood of post-9/11 America with astonishing deftness and precision, A Gate at the Stairs showcases Moore at the height of her powers. Lorrie Moore is the author of the story collections Birds of America, Like Life, and Self-Help and the novels Who Will Run the Frog Hospital? and Anagrams. She has been the recipient of fellowships from the National Endowment for the Arts, the Guggenheim Foundation, the Lannan Foundation, and the Rockefeller Foundation. She is a professor of English at the University of Wisconsin in Madison and a member of the American Academy of Arts and Letters. In addition to her sense of humor and intelligence, what are Tassie’s strengths as a narrator? How does what she describes as “an unseemly collection of jostling former selves” (p. 63) affect the narrative and contribute to the appeal of her tale? In the farming community where Tassie grew up, her father “seemed a vaguely contemptuous character. . . . His idiosyncrasies appeared to others to go beyond issues of social authenticity and got into questions of God and man and existence” (p. 19). Does the family, either intentionally or inadvertently, perpetuate their standing as outsiders? How does Moore use what ordinarily might be seen as clichés and stereotypes to create believable and sympathetic portraits of both the locals and the Keltjin family? How does the initial meeting between Tassie and Sarah (pp. 10-24) create a real, if hesitant, connection between them? What aspects of their personalities come out in their conversation? To what extent are their impressions of each other influenced by their personal needs, both practical and psychological? Are Sarah’s ill-chosen comments at the meetings with Amber (p. 32) and Bonnie (pp. 89-90, p. 93) the result of the natural awkwardness between a birth mother and a potential adoptive mother or do they reveal deeper insecurities in Sarah? Does the adoption process inevitably involve a certain amount of willful deception, unenforceable promises (p. 87), and a “ceremony of approval . . . [that is] as with all charades. . . . wanly ebullient, necessary, and thin” (p. 95)? What is the significance of Tassie’s first impression of Edward-“one could see it was his habit to almost imperceptibly dominate and insult”-and her realization that “[d]espite everything, [Sarah] was in love with him” (p. 91)? Does Edward’s behavior at dinner and the “small conspiracy” he and Tassie establish (pp. 112-114) offer a more sympathetic (or at least more understandable) view of him? Are there other passages in the novel that bring out the contradictions between his outward behavior and his private thoughts? Does A Gate at the Stairs accurately reflect the persistence of racism in America? What do the comments and encounters sprinkled throughout in the novel (pp. 80, 112, 151, 167, 229) show about the various forms racism takes in our society? Do you agree with Sarah’s statement, “Racial blindness-now there’s a very white idea” (p. 86)? What do the discussions in Sarah’s support group (pp. 154-57; 186-90; 194-97) reveal about the different perceptions of reality held by African-Americans and white liberals? What role do class, wealth, and professional status play in opinions expressed by various members of the group? In this context, what is the import of Tassie’s description of Mary-Emma’s affection for Reynaldo: “the colorblindness of small children is a myth; she noticed difference and sameness, with almost equal interest; there was no ‘Dilemma of Difference’ as my alliteration-loving professors occasionally put it” (p. 169)? How would you characterize the comments about religion throughout the novel (pp. 41, 108, 129)? What is the significance of the fact that Tassie’s mother is Jewish, a woman of “indeterminate ethnicity” in a churchgoing community? Why are Roberta Marshall and Sarah so cavalier about Bonnie’s insistence that her child be raised as a Catholic (p. 87)? How do Reynaldo’s revelations about his activities and beliefs (pp. 204-8) fit into Tassie’s view of God and religion in general? On page 296, Tassie offers a thoughtful explanation of the purpose of religion in people’s lives. Are there other lessons about the meaning of religion or faith to be found in the novel? The title of the book comes from a ballad Tassie writes with her roommate (p. 219-20). What does music-playing the bass and singing to Mary-Emma-represent to Tassie? How does it connect her to her own family and to Mary-Emma? Does the novel prepare you for Sarah’s dreadful confession (pp. 232-242)? What particular incidents or conversations foreshadow the revelations? How do Sarah’s “conventional” beliefs about men and women affect the couple’s behavior during and after the tragedy (pp. 240, 244)? Was their decision to move and start anew the best solution under the circumstances? Do the reasons Sarah gives for remaining with Edward make emotional sense? If they had been able to keep their secret hidden, would they have been able to create a happy future with Mary-Emma? Nannies and other household help often grasp things families don’t realize about themselves. Is Tassie an objective chronicler of life in the Brink-Thornwood household? What biases does she bring to her observations? How do her perceptions and opinions change over the course of the novel? In what ways does her growing attachment to Mary-Emma and her relationship with Sarah account for these changes? In what ways are they attributable to the developments in her personal life? How do the vignettes of Tassie’s visits home and her life in Troy play off one another? What do Tassie’s conversations with her family bring out about the ambivalence she (and many college students) experience? Why does Tassie fail to recognize the depth of Robert’s pain and confusion? Is Robert’s decision to join the army given the attention it deserves by the rest of the family? Does the Midwestern setting of the novel offer a distinctive perspective on September 11, 2001, and the mood of the country? How were the events experienced in other parts of America-for example, in the cities directly affected by the terrorist attacks? Lorrie Moore has been widely praised for her affecting depictions of human vulnerability and her dark humor. How does Moore integrate clever one-liners, puns, and wordplay into the serious themes she is exploring? What role does humor play in exposing the thoughts, feelings, and fears the characters are unwilling or unable to express? Does it heighten the emotional force of the novel or diminish it? “I had also learned that in literature-perhaps as in life-one had to speak not of what the author intended but of what a story intended for itself” (p. 263-64]. How does this quotation apply to your reading of A Gate at the Stairs?